Are you looking for your next outstanding color copier you can rely on? The Xerox VersaLink C7020 Color Multi-function copier offers flawless reliability, seamless integration and advanced productivity. This copier is designed to cause fewer maintenance hassles as it has been built to contain fewer moving parts and a strengthened paper path. This means less engineer call outs and less paper jams! The ability to add extra trays and finishing options means you can customize this copier to suit your business’s needs. 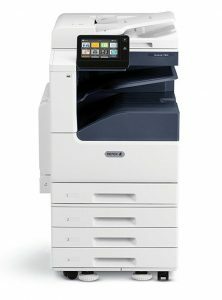 Keeping up with current technology this copier offers instant connectivity to cloud and mobile devices right from the user interface, with access to pre-loaded, cloud-hosted services that let you work where, when and how you want. A print resolution of up to 1200 x 2400 dpi delivers sharp text and fine line detail, plus exceptional color vibrancy. With a printing speed of up to 20 pages per minute this copier offers fast speed and amazing quality prints.